Dr Paul Adler is an ophthalmologist located at the Parke Street Specialist centre. An article by Dr Adler about his volunteer work in Burma (Myanmar) has appeared in the March 2012 issue of ‘Australian Doctor‘. 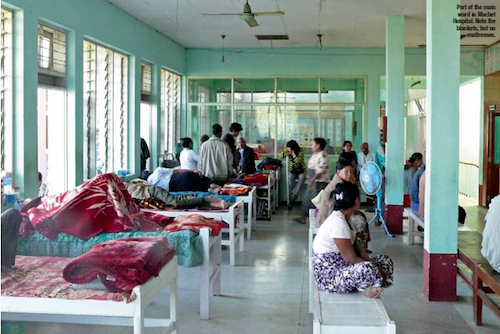 Two weeks working in remote Myanmar was both challenging and rewarding, writes ophthalmologist DR PAUL ADLER. ANY doctors at one time or another consider doing volunteer work for people who are less fortunate, or who lack the healthcare we in Australia are lucky enough to have. Doing this kind of work crossed my mind several times over the years, but it wasn’t until last year, following a potentially life-threatening event (which turned out well) that I re-evaluated priorities and was able finally to turn those thoughts into action. The trip I took was organised by the Myanmar Eye Care Program, led by Dr Geoff Cohn. Every couple of months, Dr Cohn and other Australian medical eye specialists, technicians and support staff, self-fund trips to Myanmar and volunteer their time. There were five ophthalmologists on our trip, together with three accompanying relatives who provided valuable assistance. Our purpose was to help relieve and prevent blindness, and to upgrade the skills of local staff in a region in great need. Myanmar (formerly Burma) is a country of 55 million people, with one of the world’s highest published rates of blindness and only 200 ophthalmologists. Following vaccinations — for almost everything I could think of — I found myself on a flight from Sydney to Bangkok, and then on to Yangon in Myanmar. The next leg of the trip was the source of some anxiety, as we had no tickets, either paper or electronic, for the flight from Yangon to Mandalay in central Myanmar. This anxiety proved groundless, as we were in fact met by a local with much experience in travel organisation. Things went very smoothly. On arrival at Mandalay airport, we were met by a welcoming committee from the hospital. This was the beginning of two weeks of exceedingly good treatment by the hospital and eye program staff. We loaded ourselves into a mini bus with suspension that left a little to be desired, and drove 45 minutes to the village of Wachet, through scenery including golden pagodas visible in the hills of Sagaing. At the Wachet hospital, we were greeted by another welcoming committee. After a brief snack, we were shown to our rooms, which were better than I expected, complete with concrete floor, mattresses and sheets. We were all tired from the journey, so had a relatively early night in preparation for starting work in the operating theatres the following day. I had been forewarned that the operating theatre, cases, and surgical techniques we were going to experience in Wachet would be very different from the high-tech Western phacoemulsification cataract surgery that I am used to in Australia. However, I was surprised by the great number of differences, even in the first minutes. Open thongs or even going barefoot in the operating theatre was common. Scrub brushes were shared and re-used on multiple occasions. At times there were three patients, three surgeons, three scrub sisters and three operating microscopes all in one operating theatre. Intermittent blackouts during operations are also routine — fortunately, there is battery backup power for each microscope, which allows the procedure to continue even before the hospital backup generator starts. All the staff members were very devoted, doing their best with the extremely limited resources. However, by far the biggest difference is the severity of the pathology of the patients, who in almost every case had vision much worse than our 6/60 definition of legal blindness. Most of the operations performed by the team were for cataracts. Our patients’ vision was usually so bad that there was leukocoria (white pupil), and they had to be led, shuffling, into the operating theatre, by placing their hands on the shoulders of a nurse. This advanced pathology had major implications for the techniques and difficulties during the operations. 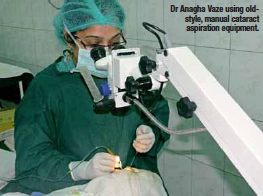 Our team of ophthalmologists included one from the US, one from India and three from Australia. This was the first time in Myanmar for myself and one other Australian surgeon, and with the exception of our Indian colleague, the average cataract we saw roughly equated with the worst 1% that we see “at home”. The microsurgical instruments also posed a challenge. We did have some new blades, but I often found myself asking the scrub nurse, “Is this a new blade?”, and asking for unbent microsurgical forceps. Another surprisingly common occurrence was extremely high intraocular pressures (IOP). Although definitions of glaucoma have changed, the statistically normal range of IOP is from 10 to 21mmHg. Among my patients on my first clinic morning, I noted several IOP measurements of 51.9 (not 50 or 52). I was reminded that with the (old style) mechanical Schiotz tonometer, this is as high as the instrument records when the reading is translated into IOP using printed tables. This of course, means the IOP may well have been 55, 65 or 80mmHg, in any case, extremely high. In almost all of these cases, gonioscopy revealed very narrow or closed anterior chamber angles. In Australia, this would be classified as “acute angle closure glaucoma”, and treated as an emergency. In my Australian practice, I see this condition about two or three times per year. Glaucoma this severe was seen sometimes 10 or more times a day in the Wachet clinic, sometimes bilaterally. Fortunately, we had drops and laser to treat glaucoma. One of the lasers was new, and I had in fact assembled it before starting to see patients on the first day. Narrow/closed angle glaucoma appears so common in Myanmar, that I estimate the nation needs about six million laser treatments immediately, followed by 600,000 treatments a year to manage what is a highly preventable blinding condition. The conditions on the wards were very basic. Patients were given a ‘bed’ consisting of wooden slats on legs. If food or blankets were desired, they had to be brought by the patients or their families. Fortunately, even in winter the night temperature does not often fall below 15°C, so most patients were able to manage by sleeping in their day clothing. I did not see a single mattress in the ward during my time at Watchet Hospital, but I did often see stray cats. Outside the hospital, including in the dirt area behind the building where fires were lit to prepare food, dogs were a more common sight. Overall, despite substantial clinical surprises and difficulties, I am pleased to have had the opportunity to take part in a program which cures and prevents such devastating blindness. Despite 15 years of working in ophthalmology, I had no idea there was disease in such numbers and advanced stages needing so much work still to be done. This work not only helps the patients, but helps their whole community, in that the patient can then look after themselves and others, such as grandchildren, freeing others to gain an education and to work. Working in the community also had what I consider to be a significant and life-changing effect on me. Life is too short not to do such work. With minor but significant changes, such as bringing with me surgical instruments to which I am more accustomed, I look forward to doing more such work, and would encourage others to do so, regardless of their areas of expertise.